Recently, I’ve had the opportunity to try several different Bloody Mary mixes, from BBQ varieties to one with ghost peppers. With 5 different bottles mix in my fridge as of now, I’ve gotten used to pouring myself a Mary on a Sunday afternoon. My current fave is The Murph’s, particularly the Hot and Spicy variety. Available primarily in New York and New Jersey right now, The Murph’s is very much a traditional-tasting Bloody Mary. It’s very tomato-forward overall, which is exactly what you’d expect. 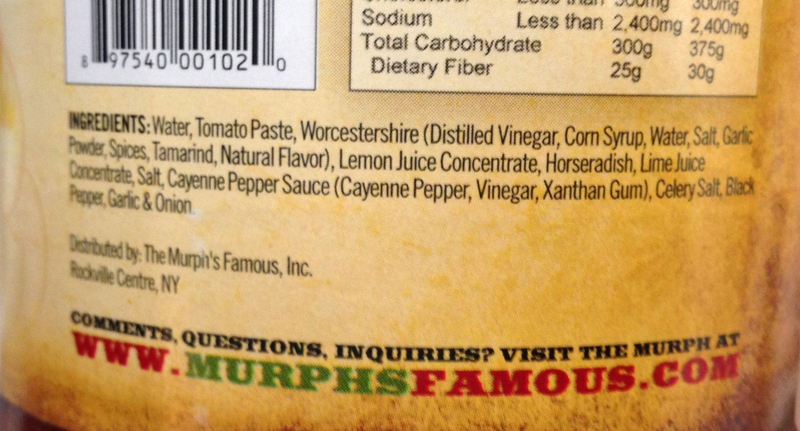 The ingredient list is the same for both versions of Murph’s, though it seems Hot and Spicy just has a heavier dose of horseradish, cayenne, and black pepper (which I love). There is unfortunately one drawback to The Murph’s: one pesky thing I found in the ingredient list, and that’s corn syrup. Now I’m no scientist or doctor, so I can’t give you a technical reason why, but I don’t like corn syrup. In fact, I avoid the high-fructose variety (HFCS) altogether. Now, the corn syrup in The Murph’s is one ingredient of one ingredient (the Worcestershire sauce), so I can forgive it to some extent, but I just wish it wasn’t in there. I like The Murph’s and I like the traditional flavor of the mix. On the whole, it make for a tasty Bloody Mary, and it’s a valid choice when you see it on the shelf, I just wish they could dump that one pesky ingredient to perfect the recipe (in my eyes). This entry was posted in reviews, tools and tagged bloody mary mix, the murph, the murph bloody mary, the murphs bloody mary on April 28, 2014 by Greg.